If you have purchased your stove or fire from an authorised stockist within our Expert Retailer Network, then automatically your product will carry a 2 year warranty as standard. 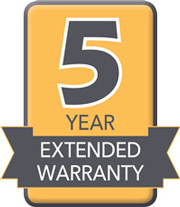 The 2 year warranty can be further extended to a total warranty period of 5 years by registering your Varde Stove or Fireplace within one month of the later of the purchase date or installation date. Accordingly, the start date for the warranty period is the date of purchase. During the registration process, the Expert Retailer details will be required for your Extended Warranty to be activated. Any product purchased outside of our Expert Retailer Network will carry a standard 12 month, non-extendable warranty. If you have recently purchased a Varde Stove you can register your purchase here. It is a condition of the Extended Warranty that the installation complies with relevant Building Regulations and the rules in force, and is carried out by a suitably trained and qualified individual (HETAS registered in the United Kingdom or equivalent in other countries) with a certificate of installation and the appropriate commissioning report completed and retained by the end-user. These can be found within your Installation and User Manual. It is also a condition of the Extended Warranty that your Varde Stove is regularly serviced (every 12 months) by a suitably trained and qualified individual (HETAS registered in the United Kingdom or equivalent in other countries). Records and receipts of annual services will be required in the event of a warranty claim during the period of the extended warranty. Consumable items such as glass, firebricks, grate parts, log retainers, baffles, ash pans, thermocouples, oxypilots, ceramic fuel effects, internal linings batteries and rope seals which are either subject to normal wear and tear or parts that require replacement in connection with normal maintenance are not covered, either by the original or the Extended Warranty. Should you experience problems with your Stove, any claim must be submitted first to the Expert Retailer from where the stove was purchased. Your Expert Retailer will either be able to offer immediate assistance or make contact with Varde on your behalf. No Warranty is extended to consumable service parts. Repair or replacement of parts which are subject to normal wear and tear during the warranty period or parts that will require replacement in connection with normal maintenance. Such parts include but are not limited to glass, rope seals, firebricks, grate parts, log retainers, baffles, ash pans, thermocouples, oxypilots, ceramic fuel effects, batteries and internal linings. a) In normal usage the paint finish of your Varde Stove may change colour slightly. As these circumstances are considered normal, they are not covered by the warranty. b) Enamelled components where these parts are subjected to abnormally high temperatures, chemical abrasion or thermal shocks, resulting in chipping, cracking, bubbling or discolouration and crazing of the enamelled finish. c) Damage resulting from installation and usage where the appliance has not been installed or used in accordance with the Varde installation and operation instructions, or if the installation does not conform to local building, fire and safety regulations. d) Defects or faults caused by specific local conditions such as draught problems and chimney defects. f) Damage or premature wear caused by burning inappropriate fuels such as Bituminous coal, “Petro-Coke” or any other Petroleum based coals. Please visit the HETAS website, www.hetas.co.uk, for a full list of approved fuels which are covered by the warranty. Fuels outside of this list are not covered by the warranty. g) Damage caused by burning material with high creosote content or any other painted/treated timber. h) Damage caused by unauthorised modifications, use or repair. i) Damage or defects caused by the product being stored in a damp, unheated environment. j) Consequential loss (to the extent permitted by law) relating to other associated products that have not been supplied by Varde . k) Consequential loss (to the extent permitted by law) related to decorations, furnishings or other household assets. l) Removal and re-installation costs. If you should ever wish to make a warranty claim because of a product fault or defect, you must inform your retailer within a reasonable amount of time, usually this is within 14 days from the date on which the fault or defect first became apparent. If the product fault or defect is notified after 14 days from the date on which the fault or defect became apparent, Varde cannot accept any liability for events or issues which arise after the 14 day period or which are caused or increased by the lack of notification which therefore prevented action being taken to restrict or eliminate any consequences arising from the fault or defect at an earlier date. In the event of a product fault occurring during the warranty period, Varde will send the appropriate component or goods necessary to rectify the fault, free of charge. Nothing in the Extended Warranty shall make Varde liable for any or special, incidental or consequential damages, injury to persons or property, or any other consequential loss beyond the consumer’s statutory rights. The liability on these issues is covered by Stovax’s (UK & ROI distributor) Terms and Conditions of Sale. Varde’s total liability extends only to the purchase price paid for the goods, except where such a limitation is prohibited by statute. Varde, in the event of a warranty claim, reserve the right to either replace the goods in question or to refund the purchase price of the goods. The Varde Extended Warranty does not affect your statutory rights. The above warranty terms and conditions came into effect on 1st July 2013 and are applicable for all relevant products purchased after this date. Appliances despatched prior to this date will have a different warranty as set out within the Installation and User Instructions that was supplied with the product. Please note: This warranty is applicable for purchases within the United Kingdom and the Republic of Ireland only. Purchases in all other countries are subject to the warranty conditions specified by the reseller in those markets.